This edition of The Taming of the Shrew is edited with an introduction and notes by series editor Stephen Orgel and was recently repackaged with cover art by Manuja Waldia. Waldia received a Gold Medal from the Society of Illustrators for the Pelican Shakespeare series. 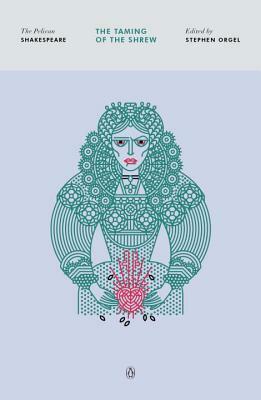 Cover artist Manuja Waldia received a Gold Medal from the Society of Illustrators for the Pelican Shakespeare series. William Shakespeare was born in Stratford-upon-Avon in April 1564, and his birth is traditionally celebrated on April 23. The facts of his life, known from surviving documents, are sparse. He died on April 23, 1616, and was buried in Holy Trinity Church, Stratford. Stephen Orgel (editor) is the Jackson Eli Reynolds Professor of the Humanities at Stanford University and general editor of the Cambridge Studies in Renaissance Literature and Culture.